What would you say if I told you that by making some changes to your website design, content, and layout you could generate over $100,000 in additional revenue in 12 months? You might think I’m crazy, but I encourage you to take 5 minutes to read this article. You might be very glad you did. Generate as much “relevant” traffic as possible. Convert that traffic into as many new patient leads and appointments as possible. I frequently lecture at dental conferences and study clubs all over North America, and almost without exception, the clinicians and staff in attendance are not familiar with the performance metric of website lead conversion. To better understand this metric, let’s start with generating traffic. There are many ways to generate traffic to a website such as high search rankings on Google, Bing, Yahoo, etc., which is achieved through effective Search Engine Optimization (SEO). Driving lots of patient reviews to review sites such as Google, Facebook, Healthgrades, and Yelp also have a very positive impact on your search rankings and traffic. Social media activity, engagement, boosted posts, and paid ads can all drive traffic to a website as well. Online directories can drive traffic, and the list goes on and on. An experienced online marketing agency with expertise in the dental industry like WEO Media should be consulted for best practices in this area. How is the lead conversion rate calculated? The lead conversion rate is calculated by dividing the amount of conversion activities (phone calls, appointment requests, etc.) by your website traffic each month. By doing this, you’ll be able to develop a baseline range for how your website typically converts traffic. Consider this example: Let’s suppose your website generates 400 visits (traffic) in a month. You received 30 phone calls from the website and 10 appointment requests through the website. 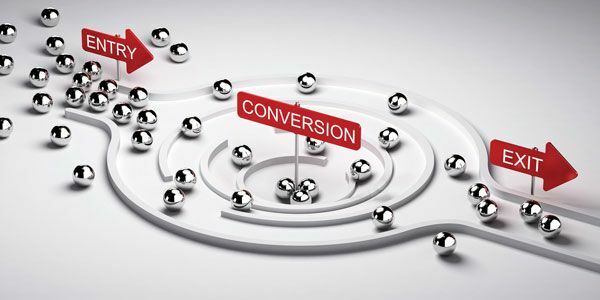 Your conversion rate would be 40 conversion activities divided into 400 visits for a conversion rate of 10%. If you monitor this rate over time, you’ll be able to understand how your website is actually performing as a marketing tool. Where this gets really interesting is when you can improve items on your website that improve your website conversion rate. Even a small improvement can result in tens of thousands or even hundreds of thousands of dollars per year in extra revenue. An average website may generate 500 visits per month with an average conversion rate of around 10%. If you can implement strategies to improve your conversion rate, and it improves to 12%, consider the impact. This slight 2% improvement equates to 10 additional new patients leads per month or 120 per year. If you can convert even 25% of these new patient leads, you’ve now generated an extra 30 patients per year. How much is that worth? Ian McNickle, MBA, is a national speaker, writer, and marketer. He is a Co-Founder and Partner at WEO Media, winner of the 2016 Cellerant Best of Class Award for Dental Marketing and Dental Websites. If you have questions about any marketing-related topic, please contact Ian McNickle directly at ian@weomedia.com, or call 888-246-6906. For more information, you can visit online at www.weodental.com.